Please ensure your child comes to nursery with a book bag as these are useful for letters, library books and master pieces they wish to take home! 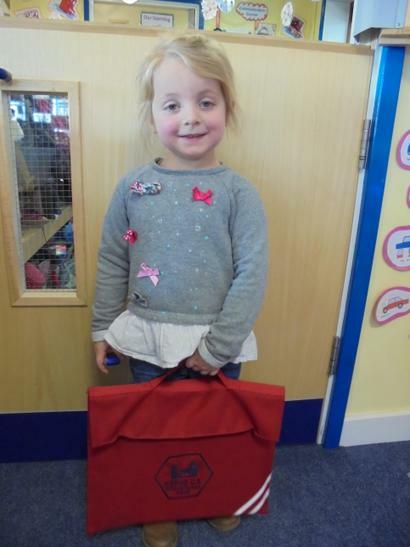 Barnums School Uniform Shop in Herne Bay sell the Herne Infant and Nursery School book bags, which are red. Your child will also need a pair of named wellies to be kept in our cloakroom for when we visit the Wildlife Area, the HIVE (the school’s enclosed mini forest) or the puddles outdoors! It is also extremely useful to bring a named bag of spare clothes into Nursery everyday just in case. As you are aware, the children often need to change into their wellies or take their shoes off for physical activity. Please could you send your child to Nursery wearing shoes they can put on and take off easily. Shoe laces take a long time to do when there are lots of children! By providing your child with suitable footwear you are also encouraging their independence skills. We are encouraging the children to put their coats on independently. Maybe they can practise this at home, showing you some strategies we teach in Nursery! Can they pull their zip up once you start them off? If your child is going to be collected at home time by a different person then please let us know at the beginning of the session. 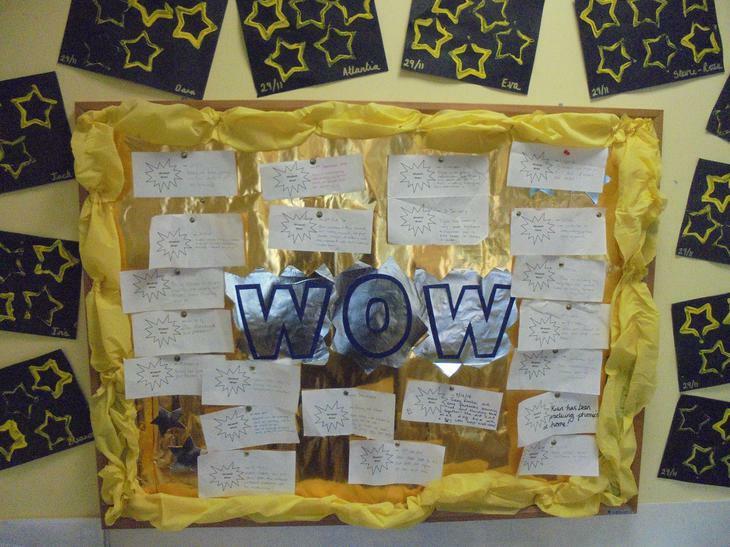 Don’t forget to send in those ‘Windmill Wow’s’ once your child has done something amazing! Your child will share their news with the rest of the children and will be put into their Learning Journey Folders once it’s been on the Windmill Wall of Fame! If you need more, please help yourself from the cloakroom as you come in. It is highly important that you see your child’s learning and what it is they do all day! Your child has their own Learning Journey folder which contains ‘work’ they do during Teacher Times and Learning Through Play (Child Initiated Play). These folders will be sent home at the end of each full term for you and your child to share and look through together. Please ensure they are returned at the beginning of the new term so that we can keep on adding to them! Alongside this, we also take photographs of your child’s learning and match them to the key Characteristics of Effective Learning on a secure E-Profile which will be emailed to you at the end of each full term. Please ensure the office have your current email address. More information will follow in due course. We are in the process of creating a ‘Communication Corner’ where you can access information about events, achievements and the Nursery curriculum. This can be found on the right hand side of the Nursery cloakroom. Don’t forget to look at our topic plan to find out what we doing! As you are aware, dates can be found on the school website. However please check the Diary Date board in the cloakroom for little reminders. Come and join in with the Nursery’s Book Swap! Inside the Nursery foyer there is a blue box full of books that your child can borrow by taking home. Once you and your child have finished enjoying a book, please return it and take another! If you have any unwanted books that you would like to add to the collection, please pass them onto a member of the Nursery Team. Thank you and enjoy! Please see our Parent Board outside the Nursery entrance for useful parenting articles and information. Alternatively, click HERE to see the articles explored and links to useful websites.